Fall is coming and with that is the back to school time for most kids across the country. Soon, the routine of getting up earlier, rushing out the door, busy crosswalks, and late night homework will be in full swing. This is a time for where good driver education really comes into play. Below we have several tips to keep in mind as the schedule of school days begins. You may see more of those large yellow busses laden with kids and you want to treat them like gold. More fatal accidents actually occur when loading and unloading busses than while they are traveling. So when a school bus stops and has it’s flashing lights or stop sign raised – STOP. No matter what direction you are traveling, you must stop for a loading or unloading school bus and wait until all the children are safely across the street and the bus lights cease flashing. 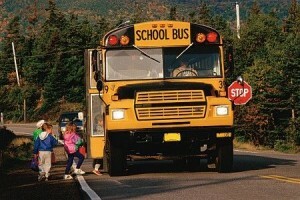 When driving with a school bus, make sure you do not tailgate as they have to make sudden stops often. Give a bus the right of way when they are merging back into traffic. This is the time to be more aware of kids at the crosswalks. Sometime when it looks clear, a tardy student suddenly appears and darts across the street. So be sure you make full stops at red lights and stop signs, and take your time checking that it is all clear before you drive through a crosswalk. School zones, that is. When entering a school zone, get in your own “scanning zone” with your foot hovering the brake pedal and your eyes searching the road and sidewalks. When kids are around, you are required to go 25 mph or less in a school zone, no matter what time of day or which day of the week it is. For example, if it’s a weekend evening and you are cruising through a school zone when children are present (possibly a baseball game just ended), you still must obey the slower speed limit of the school zone. As you reduce your speed for pedestrians, your actions notify other drivers who may not see the pedestrians to also slow down for whatever potential danger may be ahead. This way you not only demonstrate safe driving but you encourage it from the drivers around you. For those dropping children off at school, make sure that U-turns are legal and safe as you are leaving, and that the curb you are pulling up to is not reserved for emergency automobiles or school busses. Be courteous to other drivers as it can be stressful for everyone. Make sure everyone in the car is wearing a seat belt, children and adults. If your child rides with another parent, let them know that wearing a seat belt is a rule when riding in any vehicle. When the day is over, all we want is for you to be civil and considerate, demonstrate tolerance for other drivers on the road, and be patient when passing through school zones. Children and parents across the country will be so grateful for that this school year. This entry was posted in Top Driver Blog and tagged Crosswalks, Driver Education, Road Safety, Safety Tips, School, School Busses, Zone.